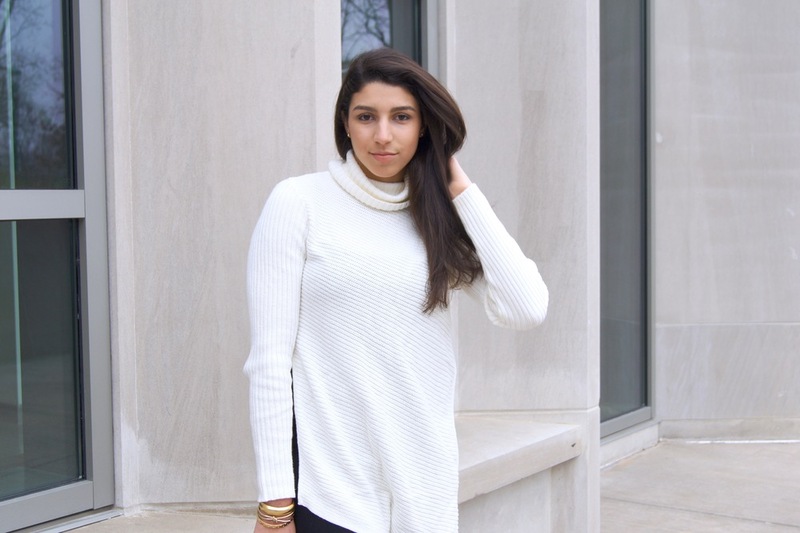 Turtlenecks are truly my new favorite type of sweater! They keep your neck warm so that scarfs are not needed, but I always like to wear non constricting turtlenecks so that scarves are an option. I'm drawn to lines and asymmetrical pieces because it adds that modern edge to the look, or in this case softness. The cozy knit sweater material helps to soften the modern look, which makes it perfect for everyday! I found this unexpected gem at Express! Levi's jeans have really changed the game for me recently. These 710s fit perfectly and black is practically my favorite shade right now, so I really lucked out. My ideal skinny jean cuts off right at the ankle. When you go longer, the Jean starts to wrinkle at the bottom and looks slightly punk-ish especially with flats. This pair of Levi's are the perfect length with all the quality they're famous for. Black boots always help to elongate the legs and when you add a heel it can really have a slimming effect! 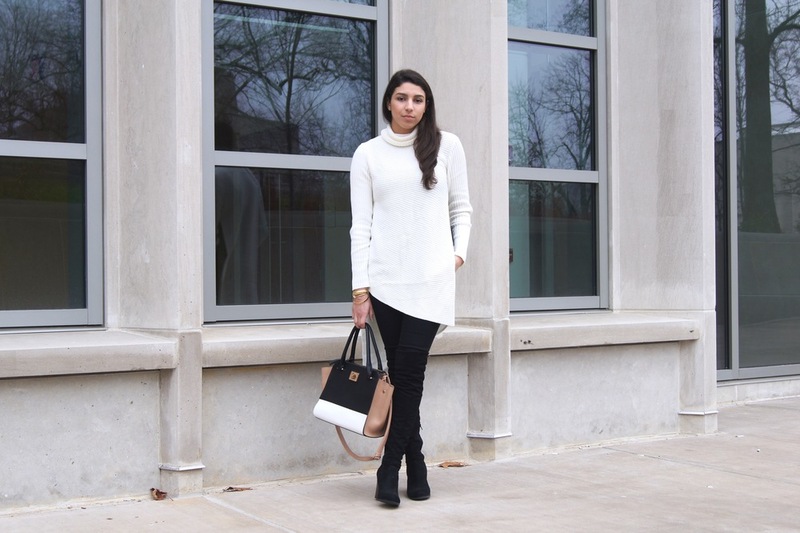 Black and white looks have a great contrasting effect that is always flattering. Anarchy street is one of my favorite jewelry companies, so it shouldn't surprise anyone that I'm a brand rep for them! The bracelet is one of my go tos and you can find the same and similar ones at their website! Use the code above to get a sweet discount at checkout! If I could change it up, I would add a pair of white boyfriend jeans and slip-ons for the winter white effect. To make the look cozier, I would also wear a soft camel cartigan.